Caiguna is located 182 kilometres east of Balladonia and 66 kilometres west of Cocklebiddy. Caiguna is said to be derived from an aboriginal word meaning "spear track" . 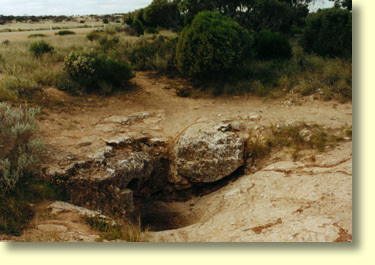 The traditional landowners of the Caiguna area and other western nullarbor lands are the Ngadju and Mirning peoples. European contact with the area began in 1841 when Edward John Eyre and his expedition passed within 20 kilometres of present day Caiguna. On 29 April 1841 tragedy struck when John Baxter was brutally murdered by 2 fellow members of Edward John Eyre's expedition. At the time, Eyre felt Baxter's untimely death was all the more ignominious given that he couldn't even be given the dignity of a proper christian burial. According to Eyre's journal the whole area was overlain with solid sheets of limestone bedrock, and apparently under the circumstances the best that could be done was to wrap his friend's body in a shroud, leaving it exposed to the elements. Nearly forty years later, a resident of Eyre's Sandpatch named William Graham organised a search party to discover Baxter's remains. Under the leadership of John Healy the search party did in fact discover Baxter's remains - minus the skull however. Near the site were also found a number of other relics, including the lock mechanism of a gun. By all accounts Baxter's bones were then packed into a calico bag and despatched to the Colonial Secretary's Office in Perth. In a peculiar twist of fate the final resting place of Baxter's bones still remains something of a mystery, even until today. Apparently all records relating to the disposal of Baxter's remains have been lost. In 1930 the Western Australian Historical Society erected a memorial John Baxter and this can be viewed 20 kilometres south of Caiguna. Caiguna Roadhouse is one of three Nullarbor Roadhouses that provide a 24 hour seven days a week service - Norseman and Border Village are the other 2. Staff at Caiguna Roadhouse are helpful, friendly and can provide travellers with a range of takeaway foods and snacks. EFTPOS, Public Telephone and pay shower facilities are also available. If you are heading to the west Caiguna might well be a good rest and refuelling stop - especially given that the next Roadhouse is 182 kilometres away at Balladonia. Travelers should note that Caiguna sells LPG Gas for cars and Premium petrol. Super Grades of petrol are not sold but fuel additives can be bought. For those of you with an aircraft, a landing strip can also be found along side the Roadhouse! Adjacent to Caiguna's Roadhouse is the John Eyre Motel which has 10 self contained Motel Units and a caravan park with camping facilities. Nullarbor Net suggests that it might well pay travellers to make advance bookings given the number of rooms available. This advice particularly applies during peak travel periods when many Motels on the Nullarbor can be booked out. For further information and bookings please telephone (08) 9039 3459. Caiguna Blowhole is located 5 kilometres west of Caiguna and 10 metres on the Eyre Highway, access to the site is and well signposted. A visit to Caiguna Blowhole will provide you with an interesting short road side stop. On the Nullarbor, blowholes are formed by chemical and physical weathering processes that erode the limestone bedrock common in this part of Australia. The name blow hole refers to the fact that these natural features breathe air in and out as high and low pressure weather systems pass accross the Nullarbor. The periodic reversal of air flows is a result of pressure equalisation between the underground caverns and the above ground air pressure. When travelling between Caiguna and Balladonia travellers have to drive along Australia's longest stretch of straight road. Despite using metric measurement for the past 30 years this area is still referred to as "The 90 Mile Straight." In metric terms that translates into 146.6 kilometres without a bend. To the south of Caiguna, in four wheel drive territory only, lies the Nuytsland Nature Reserve. Within the area are a number of sites that may be of interest to the traveller. If you have a strong interest in the history of Australian exploration, twenty kilometres to the south of Caiguna you will find Baxter's Memorial. Beyond this, on the Great Australian Bight, are the spectacular Baxter's Cliffs. 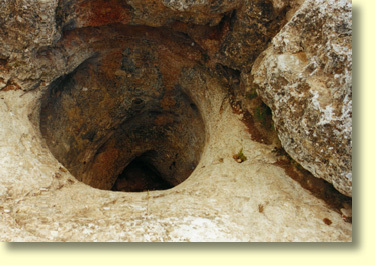 Within the Nuytsland Nature Reserve are a number of small caves and collapsed caverns known as dolines. Local Caiguna people occasionally visit these features when they are not working at the Roadhouse. One such feature has been called "Dead Dog Cave." This small cave is apparently about 6 or 7 metres deep and is the site where the mummified remains of a marsupial dog were found. Scientifically it has been classified as a thylacine but the rest of us would know it as a Tasmanian Tiger. Yes, Tasmanian Tigers did actually live on mainland Australia several thousands of years ago. To access any of the above areas in Nuytsland Nature Reserve travellers will need to possess 4 wheel drive vehicles, ask for directions and local advice from the staff at the Caiguna Roadhouse, and be prepared for overnight camping. On the Western Australian end of the Nullarbor you will see plenty of signs indicating road hazards such as kangaroos, emus and the odd camel. These signs are NOT just for show. We recommend that great care be taken when driving, particularly around sunset and at night. If ever you leave the main highway, remember that this area is VERY isolated and you need a four wheel drive, plenty of water and be prepared rely entirely on your own resources to deal with emergencies.